We went to the beach a couple of weekends ago and were inspired. Beaches alone can do this. But this time we were also awed by Iris and Gabino, whose place we stayed at in Playa Ventura, Guerrero, Mexico. Ten years ago, Gabino and Iris used to see people camping on the beach across from their small farm. Living 5 kms from town along a dirt road, campers would wander up to the couple’s place every now and again asking for directions or looking for a place to pitch their tent. Soon Gabino was busy helping campers set up and looking after their needs, with Iris cooking traditional local foods beach side. Enough campers came along that the couple decided to build a kitchen and throw up a “palapa” (palm leaf shelter) on their own small beach-front plot. They figured, correctly, that campers would enjoy respite every now and again from completely roughing. Now, several years after our own first stay with Iris and Gabino, they built, brick by brick, a few modest bungalows, two small wading pools, and a great palapa shading tents from the beautiful, but often too hot tropical sun. And let’s not talk about the kitchen. Makes me too hungry to think about the all-natural, all-local food fixed in the traditional way! Traditional fish soup from Playa Ventura on Mexico’s Pacific Coast. My partner in life Tonia mused several times during our stay over a comparison of the life this couple and their three children on the beach to that of the Strivers and Achievers in the City. Of course, their lives are not just fun in the sun. Each day the family works hard for several hours. But there is time late each afternoon for a nap, and later in the evening when the sun has set, to sit about chatting and laughing about the day’s events. Frenetic is was not. No grasping, not there. A sense of being present you don’t feel most places. “Can we all live like this?” Tonia asked several times. “If we are the authors of our own destiny, we make the life choices, big and small, of what we do, what we buy, who we spend time with,” she reasoned with hope. Yet, we ended up reflecting on the irony that we strive so hard to fix the problems, personal and social that we create simply by striving so hard…! Robert Skidelsky’s resurrection of John Milton Keynes idea of a 15-hour work week sounded pretty good sitting on the beach. And if you reflect a bit, do you really want more of what keeps you from being what and who you really want to be? We have an incredibly productive society producing incredibly destructive things and ways of life. Is this what we need for ourselves or communities? Beaches make you think this way, and I can’t help but wonder how anyone with two weeks’ vacation a year (or less) can do more than barely recuperate from life’s stress in that short of time. Europeans are smart, five weeks to start! It is no wonder we are so unconnected to Gaia. Are we, as a friend of mine recently asked, paving over the world, metaphorically and literally? Tonia says so much every time she goes to Mexico City to work, looking down from elevated highways while passing hundreds of multistory concrete buildings. 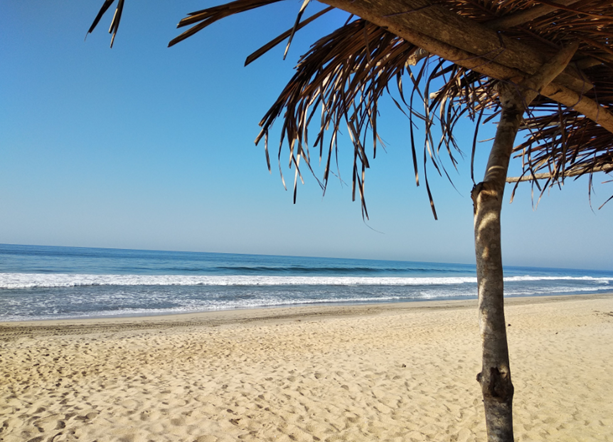 Granted it is much easier to be connected to nature on a nearly deserted beach than at home in a city or at work in a climatized building. It is so simple to be present on the beach, witness to the daily wonder of the sun’s rising, the constant crashing of waves, the primal comfort of tides rising and falling, the sun sinking into the sea at day’s end and the wonder of the moon’s rise. We all deserve the blessing and regenerative wonder of being so vitally connected, if but for a moment or two every now and again. To feel the throbbing, life giving rhythm of nature is a sustenance we know less and less. Nature is so amazingly rejuvenating. While we were at the beach, besides doing nothing, we spent a lot of time in awe of pelicans. They would glide a couple of hundred yards off shore, surfing warm drafts of air literally inches above a wave, peeling off and out to sea before it crashed on the foreshore. What was most amazing, these incredible birds rarely flapped their great long grey wings. Exquisite evolution over millennia taught them to do this. Incredible to watch, but even more incredible to know that they evolved to have such precision and grace, flying alone or in lines of fifteen birds or more, in perfect unison. Pretty powerful stuff. It is even more incredible to wonder at the connection between these pelicans and the waves, the moon, and the sun. They are all geared by the force of nature, with each wave the birds crest in sync with the movements of the moon, sun, and tides. Each fish under the water that they dive for is there in that instance for their sustenance. Just enough fish as needed for the number of pelicans in the area. All this made me think of what we are fighting for, the folks of the #Resistance, the Extinction Rebellion, the Occupy Movement, and the thousands of other organizations, and millions of individuals who seek sustainability through justice, equality, and environmental restoration. For a moment on the beach the answer was clear. We are struggling to find our way back to Gaia’s rhythms. Searching for a place of physical, emotional, and spiritually fulfillment. This is something only Gaia can give us, but we seem intent on pushing her away every chance we get. Are we afraid to be full and free? Afraid of more time, less stuff, fewer distractions? Are we afraid to live within her bounds? I think many of us are. We’ve been taught to be so, and must not succumb to these fears, and to the the bidding of the Consumer Deep State which extorts us to buy more, to ‘be’ more. We must Resist the temptation of more over the peace of less. Go to the beach, go to the forest, go to the mountains, go to the lakes and rivers, if only for a short bit of time. If you can’t, close your eyes and feel the rhythm of Gaia, Mother Nature, God, the gods, however you want to call it. Hug a tree in the parking lot if you have to! Find the rhythm for your own salvation, find it for your family, your communities, and for the world. When you come back, seek out the feeling daily. Forget cement and asphalt. Reflect on the trees and flowers everywhere. Or find Gaia among the local farmers or fishers, the craftpersons and the artisans who live in this rhythm. Buy an organic apple, or even better, grow your own! Feel its wondrous connection to Gaia as you bite into it. Know that life can be that good, that crispy, that sweet that beautiful if you choose. We don’t have to give up all that is good in modern life. And I will not romanticize the hard life many people live. But our beach memories of Gabino, Iris, their friends and family sitting about in happy simplicity at day’s end gives me hope that there is truly more, much more in less. I welcome your comments on this story. The next story in this series will wonder about you can Rebel in your life every day in big and small ways to make a difference and help save the planet for our kids and other to come.